Borrowed Design analyses the field of graphic design as a history of credits and debits by charting the transfer of ideas and images across historical, commercial and legal categories. Ranging from respectfully acknowledged influence to underhand theft or irreverent parody, such exchanges have become design’s second nature. Steven Heller and Julie Lasky lay out the varieties of ‘borrowed design’ through a staggering array of visual examples, from a series of send-ups of Doyle Dane Bernbach’s legendary VW campaign to neo-conservative appropriations of heroic realism. The book achieves something rare in design publishing, despite the rising interest in history and criticism over the past ten years: Borrowed Design looks at a broad spectrum of practice through the lens of a consistent line of questioning. Rather than present a collection of designers’ biographies, a celebration of a single movement or an anecdotal narrative with no connecting theme, Heller and Lasky have studied a diverse range of materials in terms of a single type of operation – the log of borrowing. The chapter on typography is a fascinating summary of type history that asserts the importance of repetition to the process of ‘inventing’ typographic form. From Renaissance classicism to Pop photolettering, design is seen as a series of reactions to existing models. Directed explicitly at designers, the book is full of practical information, such as the different between plagiarism and parody and the legal ramifications of borrowing Mickey Mouse’s ears (don’t do it). The authors also make numerous aesthetic value judgements about proper and improper borrowing. The most ambitious chapter is a series of case studies on ‘The Good, the Bad and the Silly’, which carefully evaluates recent examples of stylistic appropriation. ‘Good’ references to Constructivism includes a Fred Woodward layout for Rolling Stone and David King’s 1986 book Rodchenko; ‘bad’ references include Paul Davis’ juxtaposition of Constructivist typography and a realist illustration for a poster about Sherlock Holmes. In the words of Heller and Lasky, Davis’ ‘intentions were good, but the marriage of two diametrically opposed styles is unnatural.’ It is refreshing to read negative commentary in a graphic design book, given that most design publishing is strictly celebratory in function. Yet such judgments can give Borrowed Design a didactic, teacherly tone, closing down the potential openness of the subject in favour of offering designers clear guidelines on how to borrow in a legal and artistically acceptable way. The how-to emphasis of the book limits its ability to participate in broader critical debates about reproduction and appropriation. Borrowed Design does not, for the most part, attempt to situate its subject – graphic design, illustration and typography – within mass media and mass culture. While recognising the centrality of borrowing to design practice, the authors do not look at borrowing as a larger social and technological issue or at graphic design’s place in culture at large. The book’s strength as a piece of primary research is countered by its lack of engagement with the critical literature on reproduction. From Walter Benjamin’s 1936 essay ‘The Work of Art in the Age of Mechanical Reproduction’ to the media studies of Marshall McLuhan and Roland Barthes in the 1950s and 1960s, cultural critics have provoked artists, architects, designers and writers to think about the social and philosophical nature of communications technologies. 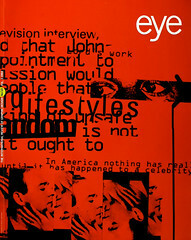 While it is no surprise to find scant references to Baudrillard in Borrowed Design, the book would have been more challenging had it looked at borrowing and repetition not only as a set of references and practices internal to design, but as part of larger social phenomena, from journalism to genetics. Writers in cultural studies and media criticism need a clear view into design practice, a view which Borrowed Design begins to provide. In both Britain and the US, writers are actively studying fashion, film television advertising, pop music and other ‘low art’ manifestations as objects worthy of serious enquiry. The results of such studies and the numerous courses and seminars in which they circulate, tend to be strong on interpreting artefacts and weak on understanding the material conditions in which media are produced. Borrowed Design, written from the perspective of everyday practice, could offer people interested in cultural studies a unique picture of how commercial media are crated. Unfortunately, the pragmatic, insiders’ tone limits the chances that it will reach such an audience. Perhaps a future book will look at the function of copying from both inside and outside design practice. Such a book would be valuable to designers because it would ask them to think about visual icons and professional procedures in terms of broader cultural developments. Such a book would be valuable to the anthropologists and critics of modern life because it would show them how consumer culture is actually made by working people.